This book presents works conducted within the framework of the project “New methodological tools for policy and programme evaluation”, financed by the EU Commission DG Justice and coordinated by the Centre for Biostatistics and Bioinformatics of the University of Rome “Tor Vergata”. 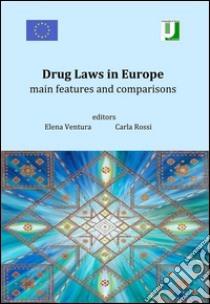 The book is divided into two parts and a guest contribution: part one is a comparison between the laws of most European countries regarding illegal drug use; part two is a more in depth comparison between Italian and Portuguese laws aimed at highlighting how apparently similar regulations are in fact quite different and have completely different outcomes. The guest contribution presents a comparison, conducted by Brendan Hughes, of penalties for trafficking in some legislations of EU countries based on data from the European Monitoring Centre for Drugs and Drug Addiction. The study of the various laws that are applied in different countries has allowed us to identify their strengths and weaknesses and verify their effectiveness. This analysis, in fact, has demonstrated that some regulations are more efficient than others because they employ a comprehensive approach to the problem of illegal drug use and are not limited to only one aspect, such as sanctions or merely procedural aspects. The debate about drug policy is often represented as a polarized choice between two options, “prohibition” and “legalization”. The reality is that there are multiple options that are in no way reducible to a simple dichotomy between these two extremes. After having analysed advantages and disadvantages connected with each national legislation, we have attempted to identify the elements contained in the so-called best practices in order to propose a homogeneous legislative framework. The point of view is not ideological, and the choice is not between a right or wrong system, but is an analysis based on the laws and facts. To ascertain best practices, it is necessary to start analysing the positive results (the facts) of legislation.